Northants have announced the signing of former Yorkshire seamer Moin Ashraf on a short-team basis. The 24-year-old will help to provide cover with Olly Stone ruled out for the rest of the season with a knee injury and Rory Kleinveldt missing for six weeks with a side strain. Ashraf, who spent a trial period at Hampshire last summer, is a right-arm fast-medium bowler who has played in 23 first class matches, taking 43 wickets, and 23 List A games, claiming 25 scalps. He also has 17 Twenty20 encounters under his belt, taking 17 wickets in that format. 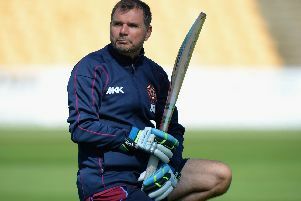 And Northants head coach David Ripley said: “Moin has registered for us with Rory out for six weeks and Olly out for the season. “We’re a little bit light in terms of numbers and Moin has impressed for the second team, particularly in the 20-over format. “He very nearly played at Worcestershire last Friday.